Computers have made our jobs easier. The time spent to do a particular task has been reduced from hours to seconds. However, this also means increase in time spent on computers which leads to physical discomfort and injuries, which affects our productivity and health. Ergonomics (or human factors) is the scientific discipline concerned with the understanding of interactions among humans and other elements of a system. Office Ergonomics deals with ergonomics in the office environment. Due to an increase in computer use, Office Ergonomics focuses a lot on computers and their use. Although, these technical definitions may seem intimidating adapting Ergonomics practices in daily life isn’t difficult. It requires little changes in the way you organize your workstation and tasks. Read on to know how little changes to your workstation and working style can lead to huge improvements in your productivity and efficiency. Contrary to the popular belief, setting up an ergonomic workstation isn’t rocket science. In simple words, it is about maintaining a neutral posture and arranging furniture and equipment to work in that posture. The computer screen or monitor should always be placed directly in front of the user. The keyboard should also be in front of the user or on adjustable tray. To prevent awkward shoulder, arm or wrist postures, the mouse should also be placed closer to the keyboard. For standing desk users also, the same principles of keeping keyboard and mouse on same level within close reach apply. All the other items for work like stationery items etc should be within reach. Right-handed people should keep these items on the right side and left-handed on left side. Although, these tips seem obvious, missing out on these practices result in awkward postures, static loads, contact stress, which may develop into serious physical disorders. Arrange your computer and other components to maintain comfortable postures while working with the monitor, keyboard and mouse. Keep your monitors at eye level to avoid any strain on neck, shoulders and upper back. This means the top line of the text on the screen should be at the eye level. If you are using a laptop, you can add height to the laptop screen by using a laptop stand. Also, maintain a comfortable viewing distance to reduce eye strain. Wrists should be straight while using keyboards and mouse. If you are using a laptop, you may have to adjust your chair to achieve this position. Place keyboard and mouse on a keyboard tray, if needed and adjust tray height and tilt until wrists are working in neutral posture. If the traditional regular keyboards are still causing discomfort to your wrists and palms you can try the other types like split, angled or keyboards with alternative key arrangements. If you associate Ergonomics with only seating, you are not the only one. Seating is important part of office ergonomics, because we spend most of our time sitting and working. Therefore, an adjustable chair is important. 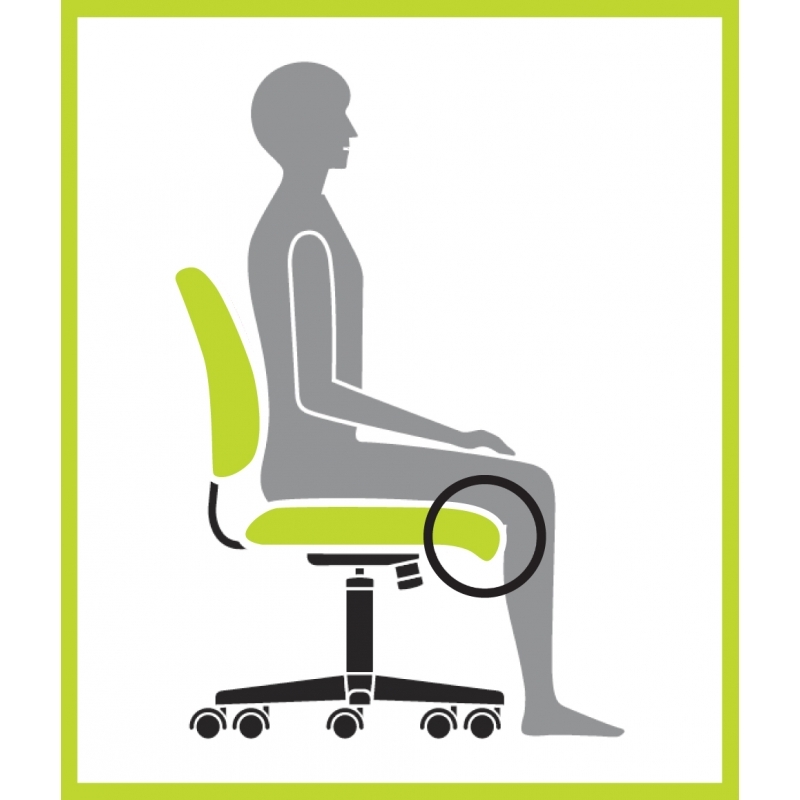 An adjustable chair provides support and allows for change of posture throughout the sitting period. When selecting a chair look for features like seat height adjustment, lumbar support, waterfall front edge, a five spoke pedestal and a swivel base. To adjust your chair to optimal height ensure your forearms are held horizontally, wrists are straight and Thighs are resting horizontally. If your feet are not flat on the ground after adjusting the chair, use a footrest to maintain neutral posture. Both harsh excessive or low lightning can cause eye strain. Therefore, it is important to maintain the optimum light levels. Glare is excessive light that causes difficulty in clearly seeing an object. Glare makes it difficult to read on computer screen and that results in fatigue for the eyes. If reflection from external light source is causing glare on your computer screen, either change the location or adjust the angle of monitor. Light levels for computers should be lower than those for reading from paper documents. It is also important that the surrounding light levels are similar to the monitor screen level. This would prevent unnecessary eye strain. The simplest way to maintain optimum levels of lightning especially for teams is to maintain low lightning as a practice and provide additional task lightning for those who need. Ergonomics is as much about the work schedule you adopt as about the tools and equipments. Often the problems start with our habits of maintaining awkward postures like twisting or turning body to reach out for something or tilting the head to speak on desk phone. These postures lead to contact stress, static load which develops into musculoskeletal disorders (MSDs). Take frequent breaks from computer work. It allows for change in posture and rest the tired muscles. These breaks need to not be of long duration. A simple heard rotation or head tilt will help in relaxing the strained muscles. You could try the technique of micropause. Pause for 20 seconds to 2 minutes if the intensity of the computer usage is high. Whether you use a sitting or standing desk, vary your posture every 15 minutes, this way the tired muscles get appropriate rest and it doesn’t increase the static load on them. Try the 20/20/20 rule to relax your eyes. Every 20 minutes, take 20 seconds to focus on an object 20 feet away. Do some basic stretching exercises to reduce muscle strain and eye strain. The changes recommended above are to ensure that you are following the best practices while working on a computer. Even after making these changes if you feel that the discomfort in your body hasn’t reduced or the pain has not subsided, it may be a good idea to consult with a professional. The principle of Ergonomics ensure that our bodies maintain the natural position and rhythm for which they are designed. Following these principles not only improve the human conditions but it also makes us more efficient and productive. Charu Babbar is a newbie in the world of Entrepreneurship. After a successful stint of ten years in Software Marketing, she decided to establish her identity beyond big corporations and designations. She blogs at ProductivitySpot.